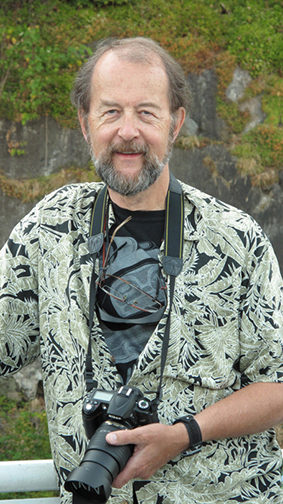 James Sutherland studied architecture after a BA in Art History and English Lit at UBC in the sixties. After working in several architects' offices, he formed his own studio to design architectural-scale graphics, banners and murals for many public buildings, for example, the DuPont Subway Station and, with the native artists of Mnjikaning, the Circle of Clans Mural on Casino Rama. His photography evolved from recording his artwork to an independent artistic practice after studying with Peter Sramek at OCA. He primarily practices three streams of photography: Landscape in search of a more efficacious understanding of our cultural and historical relationship with the natural environment; Portrait photography to celebrate the marvelous varieties of human individuality we encounter; and Photo collage to develop the artistic potential of new digital tools as photographic media approach the flexible freedom of painting. Mindful of being, as Leonard Cohen described himself, "the brief elaboration of a tube", he continues to squint through a viewfinder patiently searching for evidence leading toward Blake's 'heaven in a grain of sand' which he understands to mean Wisdom through understanding. He has been a member of Gallery 44 since 2011. His 9/4 Season Mandala shown in CONTACT 2014 combines landscape with photo collage studies celebrating our species' identification with Nature since ancient south Asia through the American Transcendentalist poets [ Emerson, Thoreau, et al. ] to contemporary environmental science. A variation on a translation of the sanskrit : "Tat, Tvam, Asi" from the Upanishads, of ancient India: "I am This, Thou art This, We are all part of This" implies that the well being of human life is predicated upon the well being of the local, continental and global environments, or as some would have it : "Do unto the environment as you would have the environment do unto you."